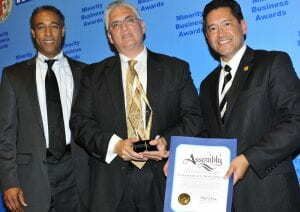 USC Civic Engagement and the Los Angeles Minority Business Development Agency (MBDA) awarded Citi Community Development the inaugural 2015 Corporate Minority Business Leadership Award at MBDA’s 20th Annual Minority Business Awards on May 19. Citi Community Development was recognized for their collaborative efforts in sustaining USC Bridges to Business Success, of USC’s Family of Business Programs. “Citi Community Development has been an instrumental partner in sustaining an innovative design in which strategic partners contribute to the recruitment, training, and mentorship in attaining contracts for these minority business owners” said Craig Keys, associate senior vice president for USC Civic Engagement. USC Bridges to Business Success supports minority and veteran-owned businesses to attain access to contracts and financing. To date, USC Bridges to Business has graduated 142 business owners that have secured $25 million in contracts, and created and retained more than 700 jobs in our local communities.